The “motor vehicle focus” is a partnership between EPA’s ENERGY STAR program and U.S. motor vehicle producers to improve energy efficiency within their operations. Tools are available here to help improve manufacturing energy efficiency, save money, and reduce greenhouse gas emissions. Motor vehicle producers can get started on a path of saving energy by using the ENERGY STAR Guidelines for Energy Management to build an energy management program, and then work within this motor vehicle focus to learn best practices from the industry. If you are a vehicle producer who wants to get involved in your industry’s efforts to save energy, contact energystrategy@energystar.gov. ENERGY STAR motor vehicle EPIs assess the energy efficiently of a plant relative to similar plants in the U.S. and Canada. The 1 - 100 ENERGY STAR score enables a quick understanding of how a plant is performing. Plants receiving a score of 75 or higher are eligible to earn ENERGY STAR certification. To learn more about how EPIs are developed, how to interpret an EPI score, and how to value benchmarking view the Benchmarking Industrial Energy Performance guide. Learn more about how the ENERGY STAR Energy Performance Indicators were developed. 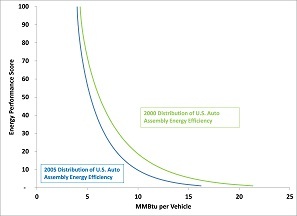 Use the vehicle assembly plant energy guide Energy Efficiency Improvement and Cost Saving Opportunities for the Vehicle Assembly Industry to find ways to improve the energy performance of an assembly plant. Also, compare the lighting levels of a plant to the best practice lighting levels used by companies participating in the ENERGY STAR Motor Vehicle Focus by using the Motor Vehicle Plant Lighting Level Best Practices. Fossil fuel use decreased by 12 percent. The gap between top performing plants and others closed while the performance of the industry as a whole improved. Environmental savings are more than 700,000 metric tons of energy-related carbon. The improvement in the energy intensity is shown below.